This end-of-unit test includes three-digit addition and subtraction problems, up through 1,000. 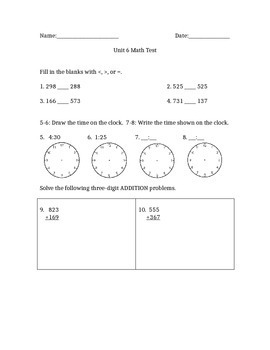 Test also includes word problems, time (reading and setting), and three-digit number comparison. This test aligns with objectives from Common Core Standards curriculum (Math Expressions - Unit 6).